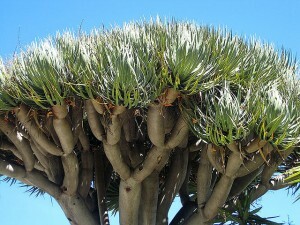 Distribution and habitat: Native to the Canary Islands and now endangered in its natural habitat, the Dracaena draco is one of the world’s most unique and grand feature trees. With succulent branches and strap-like leaves, thick smooth trunk and blue-green foliage, even when young, Dracaena draco gives off an aura few plants can match. Its hardiness and will to survive make it the perfect plant for our drought stricken lands and worthy of the title ‘the ultimate in architectural planting’. Description: Dracaena draco is an evergreen tree with a single, smooth grey trunk which eventually becomes multi-stemmed when the plant is much older. Attractive blue-green leaves may grow up to 60cm (23 inch) long and 5cm (2 inch) wide. The leaves are somewhat severe, stiffly pointed that end in something resembling a spike. The leaves are solidly green, as the old leaves die the stem gradually unveils with a scaly pattern. The Dracaena draco will grow to 0.9-1.2m (3-4 feet) indoors. At about 10–15 years of age the stem stops growing and produces a flower spike with white, lily-like perfumed flowers, followed by coral berries. Soon a crown of terminal buds appears and the plant starts branching. Each branch grows for about 10–15 years and re-branches, so a mature plant has an umbrella-like habit. It grows slowly, requiring about ten years to reach 1.2 metres (4 feet) in height but can grow much faster. Care: Thrives in a moist well drained soil in a sunny or partly shaded position and is drought tolerant when established. Avoid wet boggy soils and over-watering. Dracaena draco will appreciate good organic matter. Slow growing; takes about 10 years to reach about 1.5m (5 feet). Water gently to keep soil moist. Avoid watering the tip of the plant. In a garden bed no watering is needed. Apply soluble / slow release fertilizers. Once established the Dracaena draco doesn’t need regular watering as its leaves are a dew and rain trap. It thrives as well in pots as in garden beds. It can remain potted for many years and can be replanted at any age. It is highly resistant to diseases and pests. Propagation: They can be propagated from cuttings, just remove a branched section at the node, up to 1m (39 inch) long and plant in a sandy mix in full sun and stake it so it doesn’t moves and be careful not to break the growing tip. Propagate Dracaena draco directly from seed as long as it’s kept constantly moist. Keep the planted seeds out of direct sunlight and maintains a temperature of between 18-30oC (65-85oF). After at least one month the seeds will germinate and produce tiny green sprouts. After sprouting, transplant each seed sprout into a separate 12cm (5 inch) diameter plant pot filled with a 50-50 mixture of sterile potting soil and peat. Place the pots in a partially sunny outdoor location or a sunny indoor window. Use: A magnificent feature plant to add drama and impact to any style of landscape. An excellent plant for a decorative pot.